Had the Telegraph on the phone. Apparently the Co-operative are starting a Christmas savings club with all money ring-fenced. I personally think this is great news and hopefully they will join the CPA! Apparently FVC have been working with them so kudos to them. Hope other companies follow suit! Ah, thats great news to hear! The Co-operative Group is to become the first major UK retailer to launch a Christmas savings scheme which provides greater protection for consumers' money. Because Christmas clubs are not regulated, they are not covered by the Financial Services Compensation Scheme (FSCS). This means that, should the worst happen and the company goes bust, consumers could stand to lose some or all their money. They also won't be able to turn to the Financial Ombudsman Service (FOS) for help if they can't resolve a complaint with the company directly. To provide consumers with greater protection, the Co-operative is to set up a trust structure to protect savers' money. Full details of the Co-op scheme won't be revealed until it is launched in the New Year, but the development of the trust has been backed by the Farepak Victims Committee, which was set up after the Christmas club collapsed in 2006 resulting in nearly 120,000 people losing, on average, about £400 each. Thousands of Co-op customers already save for Christmas by buying £1 stamps during the year, which they can then cash in when they do their festive shopping. Shoppers who buy stamps before the new scheme comes into effect will be able to redeem them as normal but won't be covered by the new scheme. Great that the Co-operative have done this! However, members of CPA have the added protection of FSCS now also. Wish that fact that been put out. Hope other companies follow the lead and start thinking about protecting pre-payment schemes! The Co-operative Group is to launch a Christmas savings scheme trust, offering consumers greater protection following the collapse of savings club Farepak six years ago. The group said it had been approached by the Farepak Victims Committee to open a new trust that would ring-fence savers’ money and keep it protected. 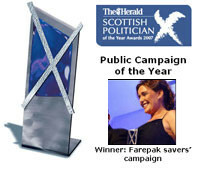 Swindon-based Farepak collapsed in 2006, but its saving scheme was unprotected leaving 114,000 people with total losses of £37m, averaging hundreds of pounds each. Martyn Wates, deputy group chief executive of The Co-operative Group, said: “The memory and impact of Farepak’s demise is still felt by many households within the UK. A Co-op spokesman said the group was only approached by the Committee “a few weeks ago”, but he confirmed the money would be ring-fenced in a separate “banking facility”, although the details are still to be worked out. The scheme will launch in January. Deb Harvey, secretary of the Farepak Victims Committee, said: "By putting this new scheme in place, The Co-operative Group really is underlining its care for communities." Suzy Hall, national coordinator for a separate campaign group, Unfairpak, welcomed the Co-op’s scheme, adding it may help put pressure on other companies, such as supermarkets, to ring-fence their savings schemes. "It's fantastic the Co-op have done this. I hope with the Co-op doing this, it will help other companies to follow suit. The supermarket schemes are still not protected." Ms Hall, also director of consumer affairs at the Christmas Pre-payments Association, which includes the Post Office, invited the Co-op to join the CPA as further proof they are serious about consumer protection. The Co-op spokesman said the group wouldn’t rule out the possibility of joining the CPA "if we thought that by doing this we would help move things even further forward in this area." Agreed, CPA still has that extra layer of protection. Suzy, would it be correct to say the Co-op will be self-regulated? Angie, I think it would be fair to say that yes.